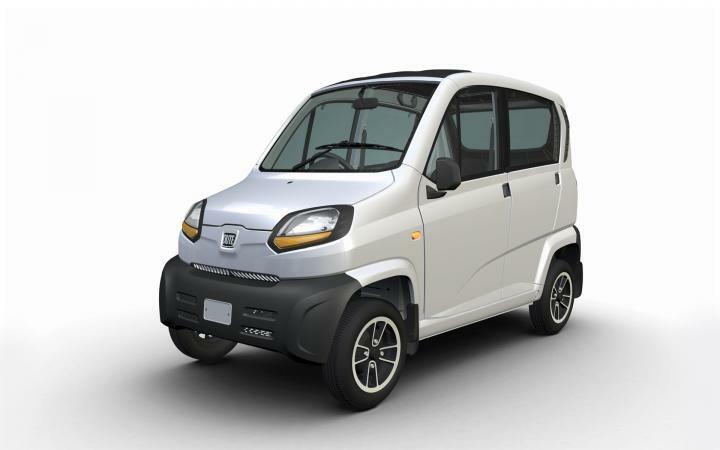 According to a media report, Bajaj is set to formally launch the Qute in India on April 18, 2019. The quadricycle is reported to be priced at Rs. 2.63 lakh for the petrol version and Rs. 2.83 lakh for the CNG version (ex-showroom, Delhi). The Bajaj Qute measures 2,752 mm in length, 1,312 mm in width, 1,652 mm in height and has a wheelbase of 1,925 mm. It has a luggage compartment in the front, which has a carrying capacity of 20 kg. The vehicle can also be installed with a roof rack that can hold up to 40 kg of luggage. It has fibre doors with sliding windows at the rear. It can seat up to 4 persons. The Bajaj Qute is powered by a 216.6cc, single-cylinder petrol engine that produces 13 BHP @ 5,500 rpm and 18.9 Nm of torque @ 4,000 rpm. With CNG, the peak output drops to 10.83 BHP and the torque is restricted to 16.1 Nm. The engine is mated to a 5-speed gearbox that can be operated via a dashboard-mounted sequential shifter. The claimed top speed of the quadricycle is 70 km/h.